Something ominous is afoot around Magnimar's famous monuments. The mayor hired an official investigator to get to the bottom of the situation, but the latter's methods have overlooked key evidence. Unable to secure the investigator's cooperation, a local governing body called the Varisian Council has turned to the Pathfinder Society for aid. 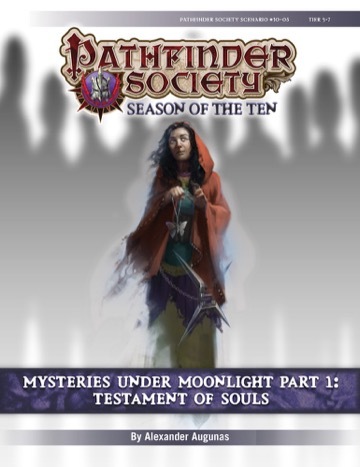 The Pathfinder Society's efforts to cleanse the monuments and discover the source of their corruption are certain to stir up trouble as the PCs draw closer to a confrontation with a lurking evil force. In. I'll play Merisiel again to apply to my 1st level Rogue. I think I have a couple of 3-7's I could dig up. I'll be there. Hoping for low-tier, but have an overabundance of PCs in high-tier. Won't be able to make it tonight. Will be there next week. Have a great time!